The most epic mountains we’ve ever seen. Like a painting, really. 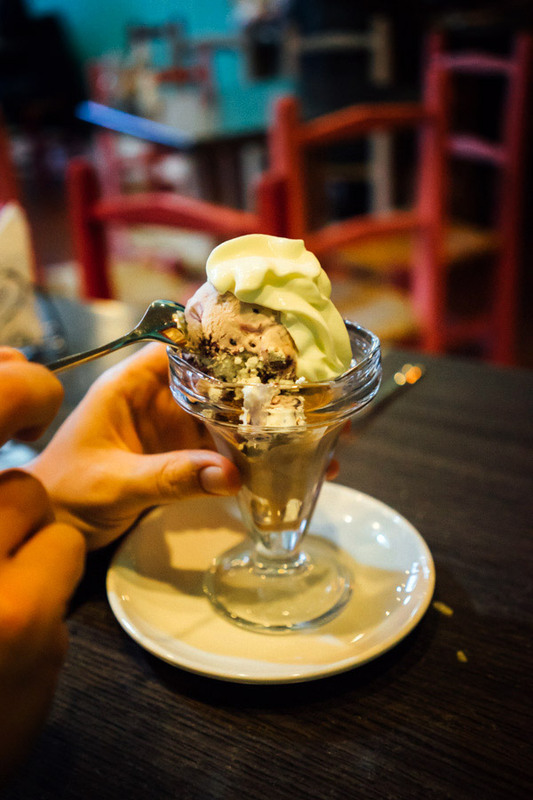 Puerto Natales was made for the North American and European tourists, with its fine dining restaurants, coffee shops, and overpriced backpacker hotels. We feel out of place already, in so little time since disembarking from Navimag. We find a simple homestay and poorly negotiate for a week stay. People come to Puerto Natales with dreams of a wet, cold week of trekking in Torres Del Paine, the dramatic Mordor-like national park of the area. They come for the letter-named treks, the W and the O. Hordes of heavy duty backpackers exchange looks of approval at the brand of their snow shoes, while we, the underdressed, out-of-shape, unprepared travelers come into town to find a cheap way into the park and see how we can waste a little time. 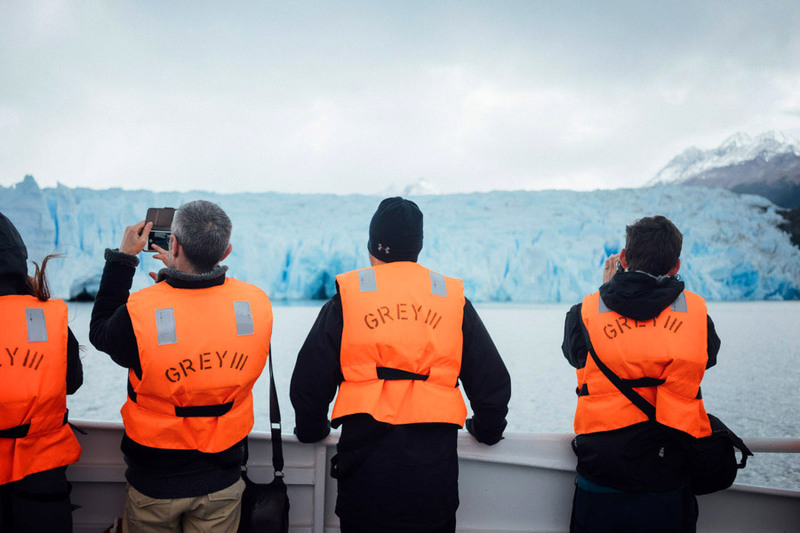 We want to stay in Patagonia to find a last-minute ticket to Antartica. 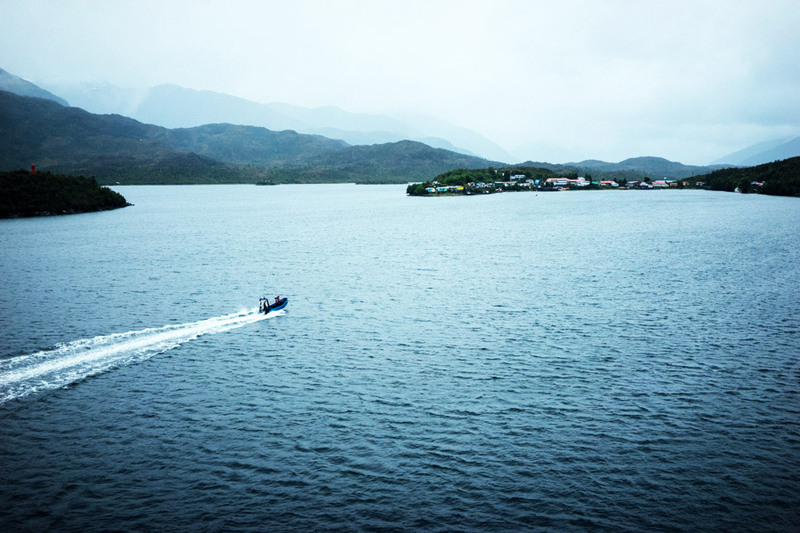 For so many a destination, Puerto Natales is only a stop to us. En route to Grey Glacier in the southern Patagonian Ice Field. After deciding on taking it easy, we rent a car with credit card points, quickly calculating that bus tours will only cost too much and tell us where to go. 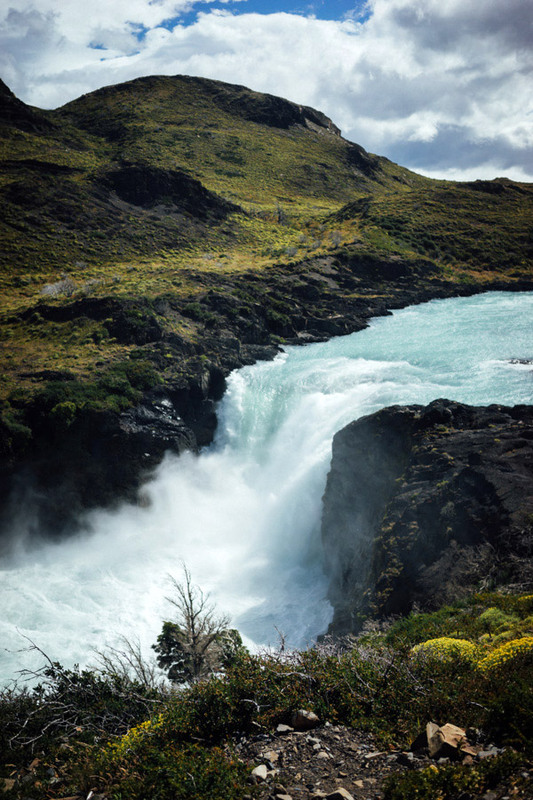 It’s a beautiful ride through the Patagonian landscape, carved by cold winds and incessant rain. 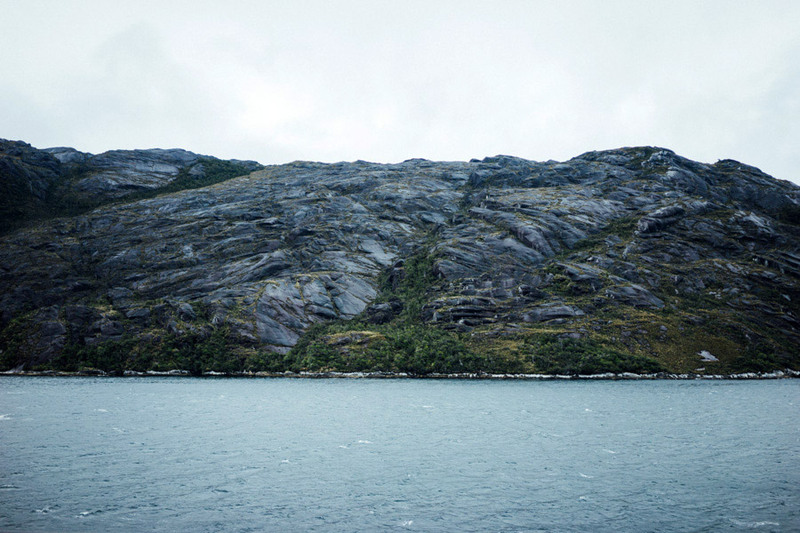 We arrive at the park, blown away by gusts as soon as we open the door, quickly making our way to a first stop for a boat ride to the glacier of a bright, fluorescent blue. We’re certain we found Superman’s hiding spot when they explain the color is due to the density of the ice filtering out all other colors. One small section of Grey Glacier, a mountain glacier in the Southern Patagonian ice field that’s 6km wide and 30m high. The colossal peaks of Los Cuernos, carved by ice millions of years ago, are simply breathtaking. In months of travel, we had never seen anything so grand and menacing at the same time. We drive around the park, amongst the yellows of the grass, the bluest blues of the lakes of glacier water and rock flour, and the grey, black, and whites of the park’s peaks, culminating above 2,500 meters. It’s easy to get lost and wander around here. We drive back to town, silent, still in awe of the park, when we see a backpacker in the middle of nowhere. He tells us his story over the next half hour: he’s Russian, came from a sailboat crew in Antartica, and is now walking and hitchhiking all the way to Buenos Aires before flying back home. It’s not so bad, he says, his backpack is only 45kg and that’s mostly due to the sub-zero tent. We drop him off in the middle of another nowhere. Where we picked up our Russian hitchhiker. Long roads, beautiful views, rays of light. A cold and stormy summer day in Southern Chile. After a few more days in Puerto Natales, we make our way to Punta Arenas, still hoping for a chance to get tickets to Antartica. The current price is still over $12,000 per person. We quickly find Punta Arenas to be too expensive for us and won’t stay long, and finally admit to ourselves that Antartica will have to wait for next time. We’re in the high season still, and even discounted tickets are well over our budget. This is the first and only time cost is a real limiting factor. We give ourselves a well-named consolation prize: an afternoon trip to Isla Magdalena, full of penguins. Amongst high pitch screams and unexpected smells, we become enamored with the little animals. A giant penguin colony in the middle of the Strait of Magellan. Every year the Magellanic penguins arrive here to breed on Isla Magdalena, mating with the same partner and returning to the same burrow year after year. If we weren’t going to make it to Antarctica to see penguins, at least we could see them on Isla Magdalena. This was the furthest south we made it in South America, and these little guys were here to greet us. It’s a bittersweet end to the South of Chile, but it’s time to start our way back up South America’s west coast. We have a lot more to see, to learn, and to do. We missed our Antartica goal but made a true, new friend. Patagonia will stay one of the best memories of our trip. 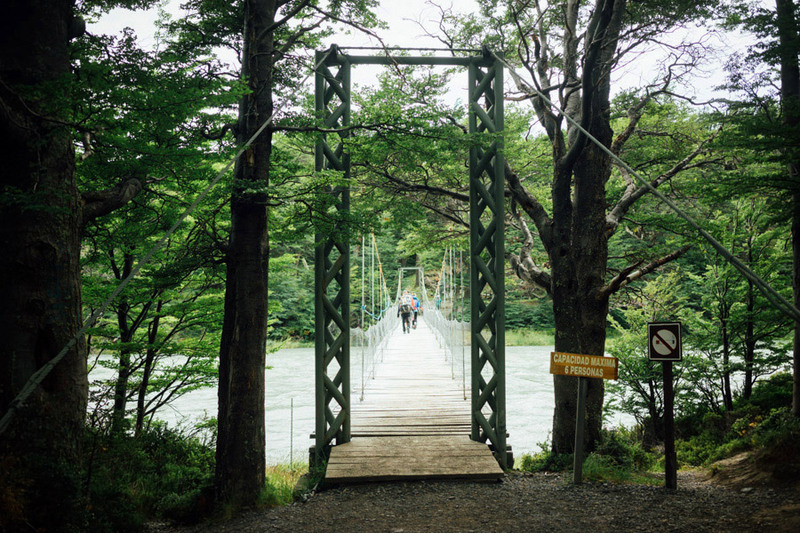 Puerto Natales is the entrance to the park. Buses to and from El Calafate are available to get there, but the best way is with Navimag or by plane. Torres Del Paine is a unique park and an experience like no other. Plan weeks or months in advance if you want to do the 5 or 10 days trek, respectively the W and the O. It seems well worth it but requires significant gear. Punta Arenas is the closest point to Ushuaia. 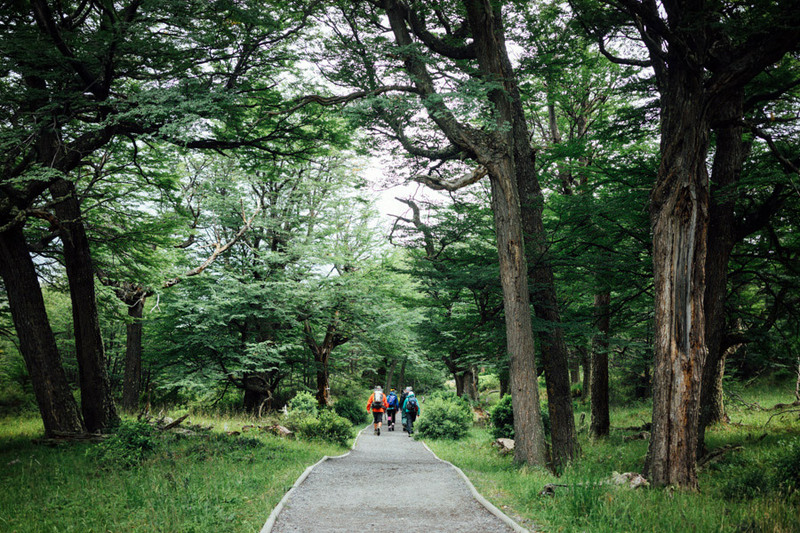 A few more parks can be visited from the town, including Isla Magdalena, or it can be a starting point to Ushuaia (by cruise or air). Fellow shipmates on deck. 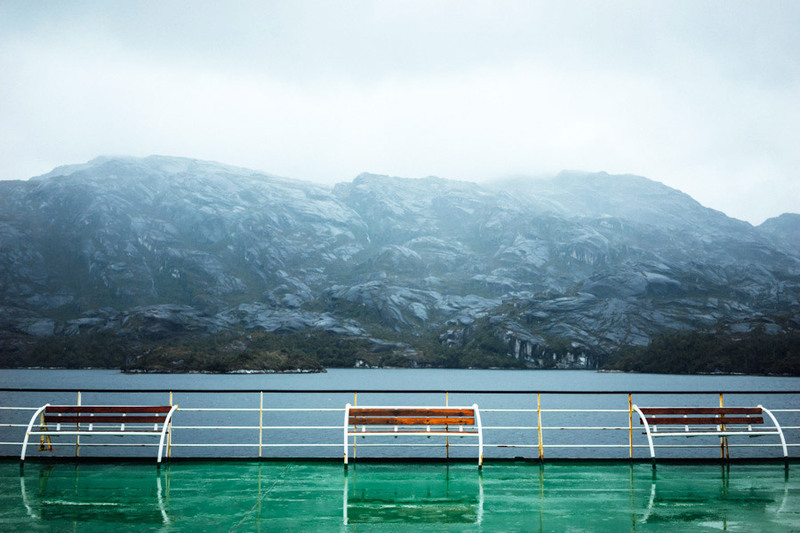 There was a constant cycle of rain and shine through the Patagonian channels and fjords. 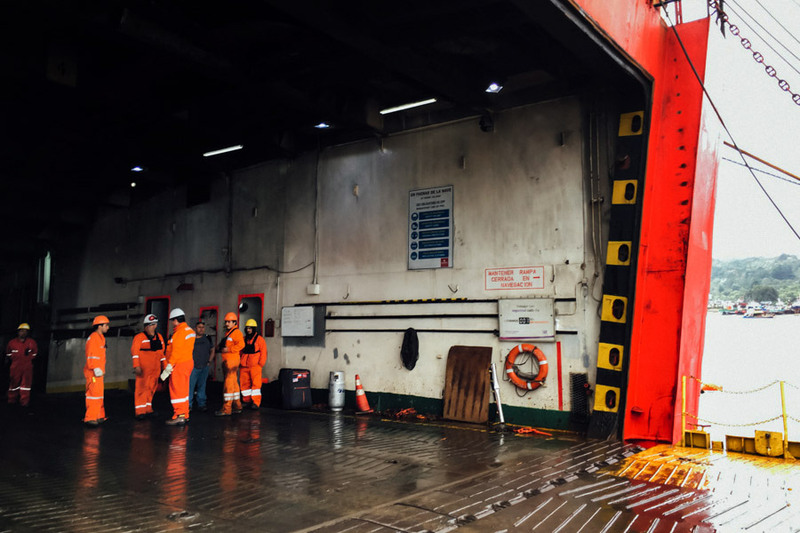 We leave Puerto Montt, the industrial port in the middle of Chile, to head down to Puerto Natales in Chile’s southern tip. There are few roads for this long voyage, and all of them require a passage back to Argentina. So we picked another route: we’re about to embark on a boat through more than 1,500 kilometers of Patagonia’s channels and fjords. 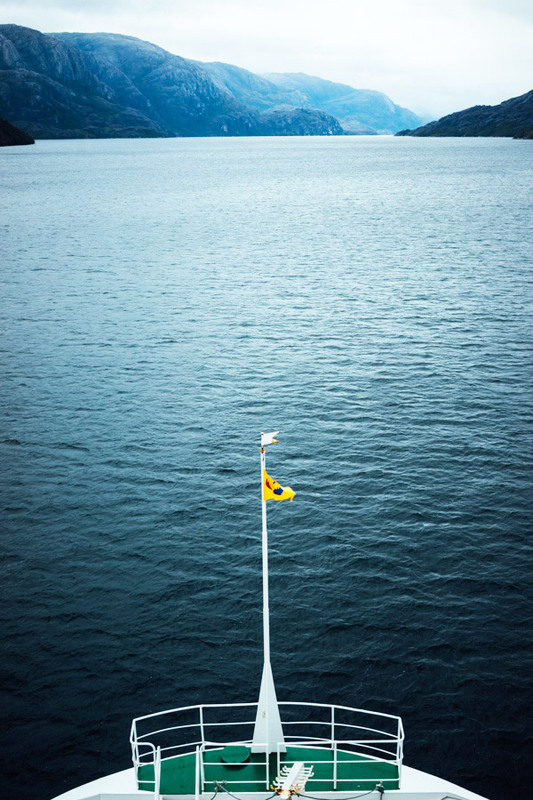 The beginning of our four day trip through the Patagonian fjords from Puerto Montt to Puerto Natales. 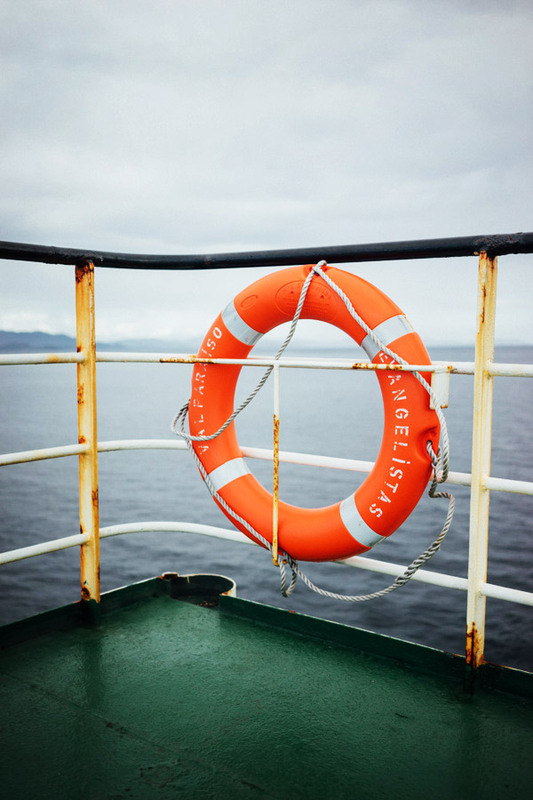 Where else can you hitch a ride on a cargo ship? After a warm welcome by Percy, our naturalist for the next four days, a bus takes us along Puerto Montt’s docks. 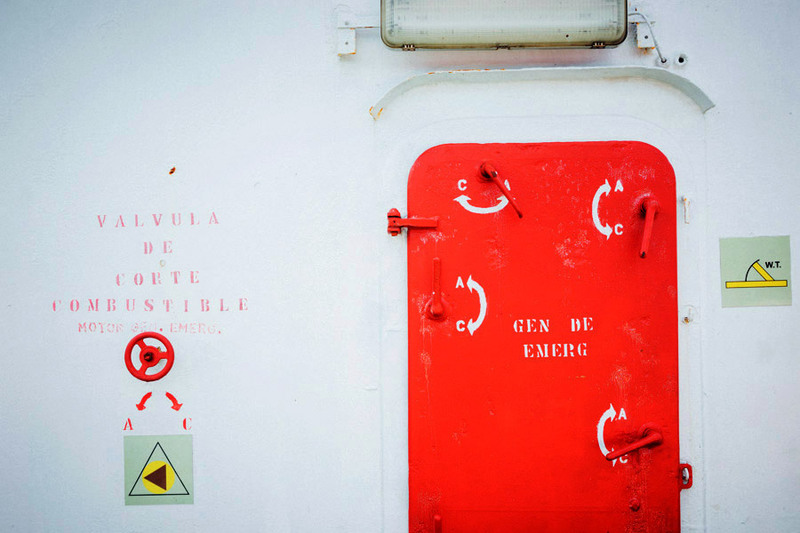 We walk onboard a simple cargo ship, with lorries and their drivers, motorcycles and their heavily bundled adventure riders, large luggage and their unprepared tourists, a few locals making their way south, and us, climbing the vessel’s ladder with childish eagerness and apprehension. We set our backpacks in our tiny room, lucky to be given a private one, and race to the top level to watch the crew loading and securing trucks. We all gather in the cafeteria, warming up on tea. Safety disclaimers and route are explained by Percy before we leave, already a couple hours late. 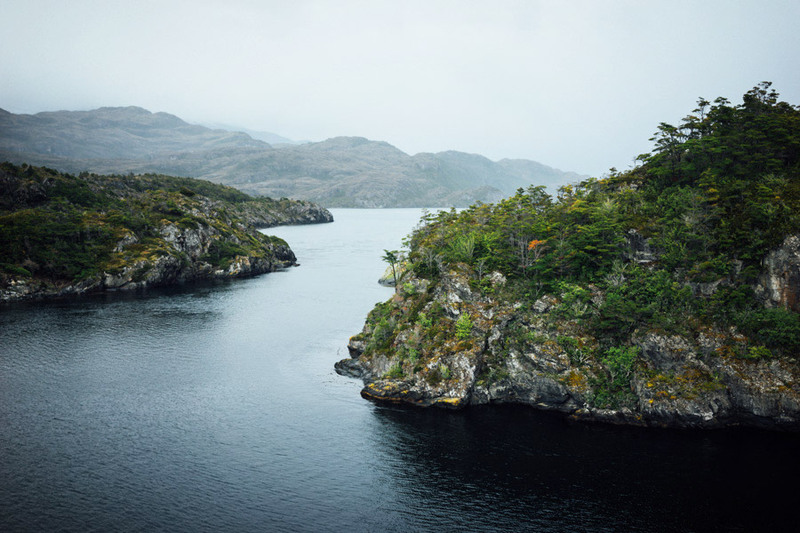 And for the next days, we navigate the narrows in the cold, barren Patagonian landscape. Observing the 1968 Captain Leonidas shipwreck in Messier Channel. It’s an overwhelming feeling of peace amongst the quiet channels, in the cold winds, in the gentle rain on empty land, only disturbed by the energetic cormoran making its way to the other island. 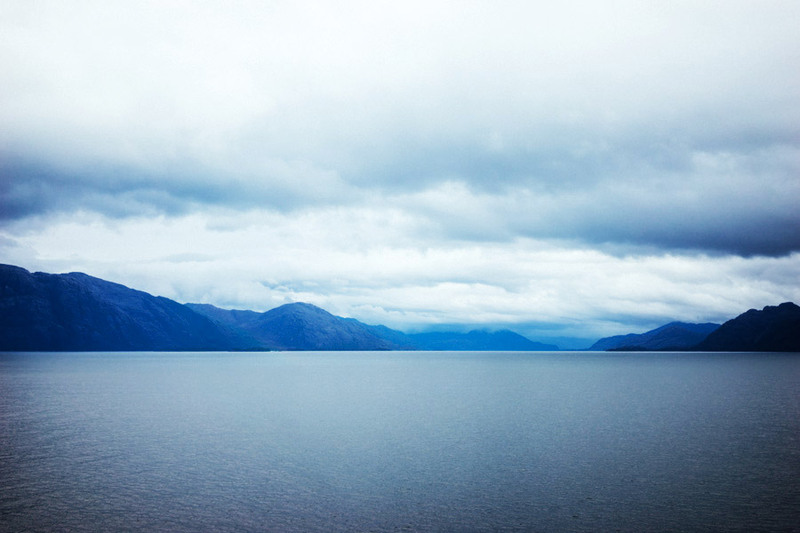 We feel at the edge of the world, a place where it all started. Percy explains how the difficult climate helps us understand how vegetation started on the rest of the planet, with lichen, brush, small trees, and bird poop as fertilizer. We watch the deserted landscape, bare of any human life except one village we’ll pass by and stop for a two hours, dropping off groceries. The twice-weekly boat is their only connection to other cities in Chile. Always on lookout. 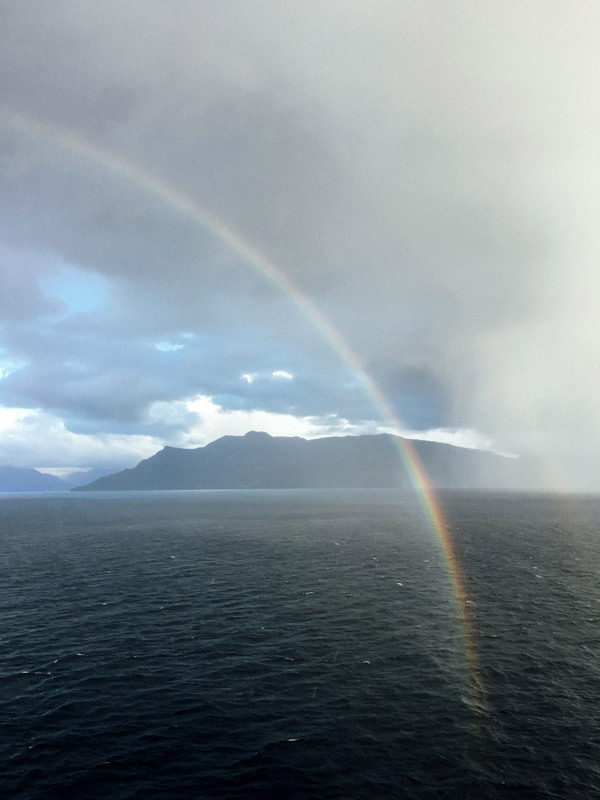 We saw everything you could possibly imagine: orcas, blue whales, Commerson’s dolphins, baby seals, cormorans, albatross, arctic terns, petrels, and, of course, double rainbows. Madie and I carefully isolate ourselves, finding an empty bench by the sea level, talking for hours and waiting for orcas, whales, and seals. The rain is always here, on and off, a companion we’re getting used to while we sip on boldo tea. We fall silent to the sea, laugh at double rainbows, and awe at sunsets. 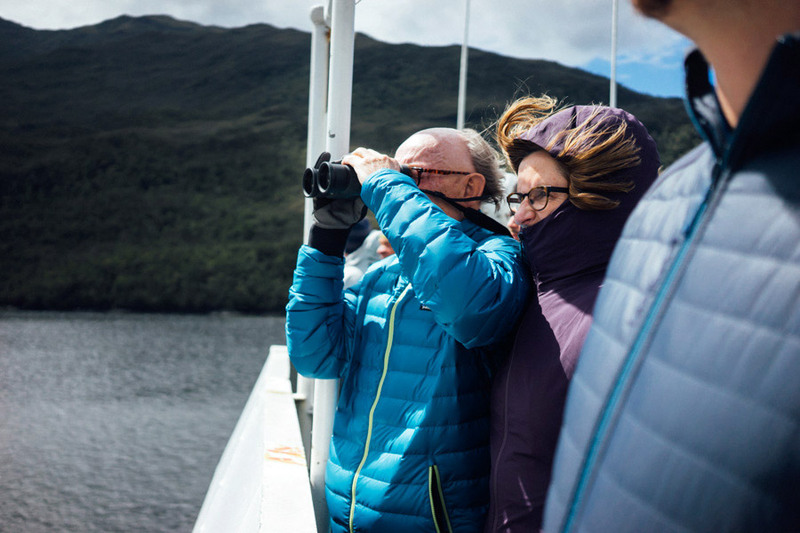 We spy albatross, petrels, and Commerson’s dolphins. As we make our way south we bundle up and put on more layers; Madie is wearing as many clothes as she can. Back to the top level for dinners, stories of high school are exchanged over cafeteria food as 3-meter waves start when we exit to open sea for a night. We walk back down, carefully walking to the waves’ rhythm and try to fall asleep. Trying to spot the Commerson’s dolphins surfing on the wakes. You can see the change in flora as we near the end of our four day voyage. 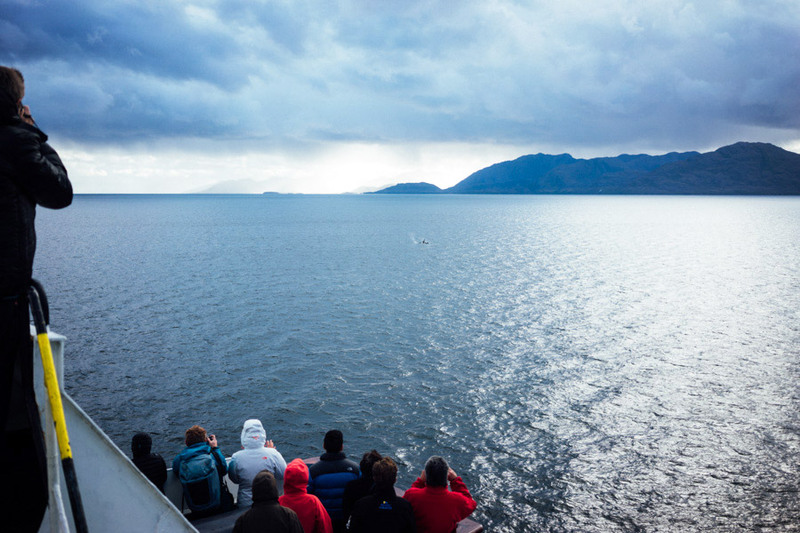 It’s already the last day, we approach Puerto Natales, stuck at sea until the winds calm down. A few hours late on schedule, we exit the ship amongst a handful of unhappy tourists. We didn’t want to leave. Patagonia, our newfound friend still has much in store for us, but we’ll always remember the amazing introduction of its channels and fjords. 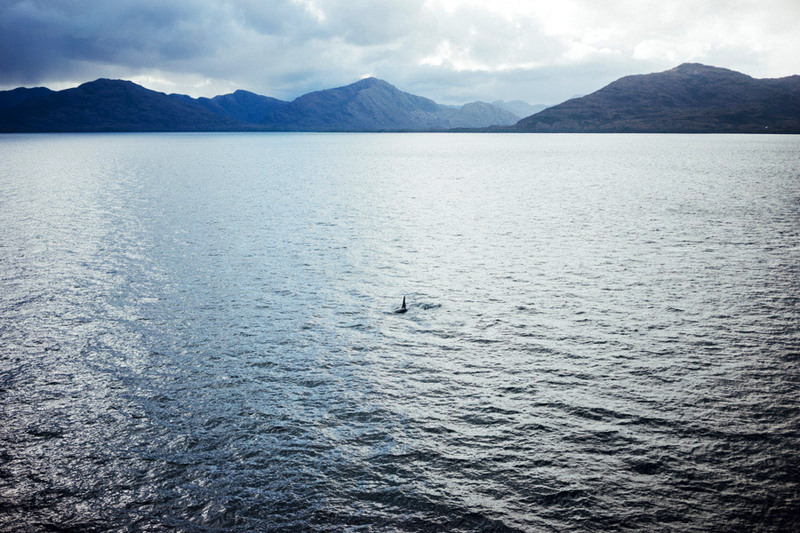 Our backpacks back on, we walk a mile to our homestay, our minds still at sea, still in the tiny cabin, in our laughs at rainbows and cormorans, in the heart of Patagonia. A photo with our naturalist, Percy. We were the last ones to disembark. The Navimag ship at the end of our 1,500+ km journey, docked at Puerto Natales. Puerto Montt has little to offer, apart from the entrance to the pretty Chiloé, and the port that leads to South of Chile. 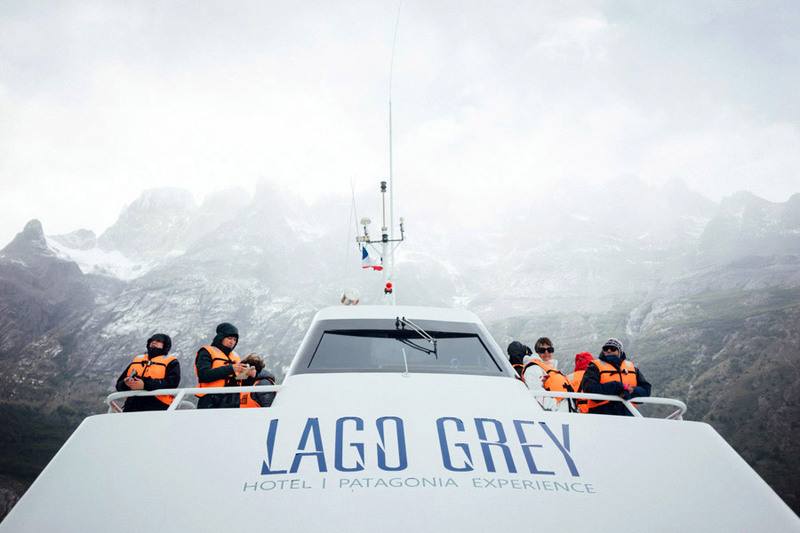 Navimag is the only carrier for this route by boat, well worth the money for the unique experience of Patagonia via its channels and fjords. However, do not expect a cruise. There were a few unhappy customers expecting a lot more luxury than what it actually is; your fellow riders are lorry drivers. We landed in Puerto Natales, the entrance to Torres Del Paine. Tours to El Calafate are also available from here, although not advised considering how far it is. Palafitos: the wooden stilt houses in Castro, Chiloé that were built to withstand the dramatic rising tides. Together with Tonya we make our way back to Chile on another Andes bus crossing. After a night in Puerto Montt, we rent a car and hop on a ferry to explore the island of Chiloé, its ceviches, churches, and beautiful rolling hills. We have no real plan except to follow the chain of wooden UNESCO iglesias. 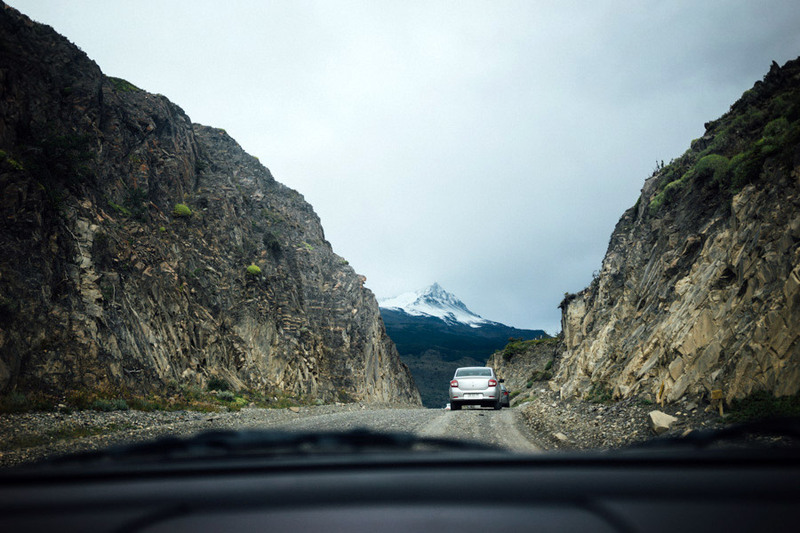 The dirt roads of Chile bring us to impossible places - places we settle and stay silent (sometimes), meditate, do yoga, get attacked by bees, eat pasta, and drink. 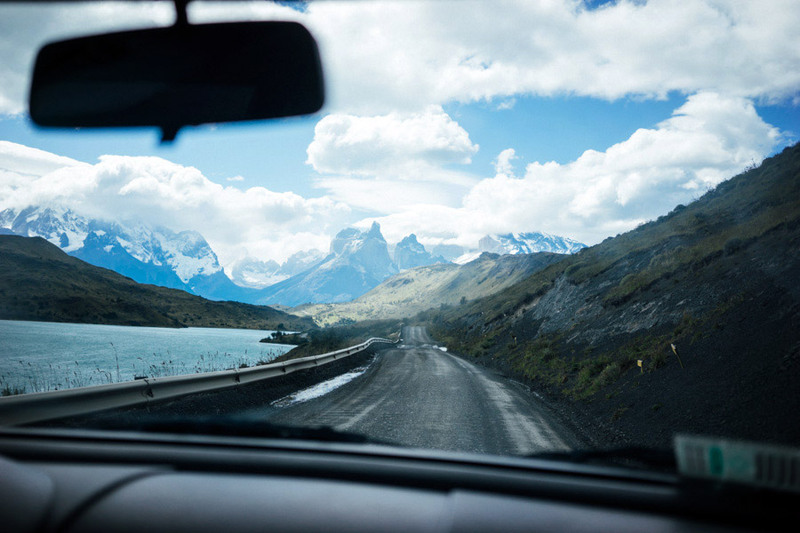 The open road on Chiloé Island, Chile's largest. It felt good for Alex to be behind the wheel again, driving through the rural landscapes, sleepy fishing towns, and tracing the wooden church circuit. Chiloé’s colorful produce. We thought the brown wrapped items were some kind of animal skin because they look like thick pieces of leather, but they’re actually folded pieces of dried bull kelp leaves harvested from the sea. You learn a lot about food culture browsing local markets like these. This one was a reminder of how remote Chiloé is from the rest of Chile, and how resourceful the island people are. All signs point toward a fishing boat, toward the coast. We’ve seen countless roadside memorials traveling through South America, but this was the first time we could stop the car so I could take a photo. There’s a strange vibrancy on this large, quiet island full of colorful churches, decorated cemeteries, and bright markers like this one. Chiloé is a recluse isle of farmers, fishermen, and new tourism. 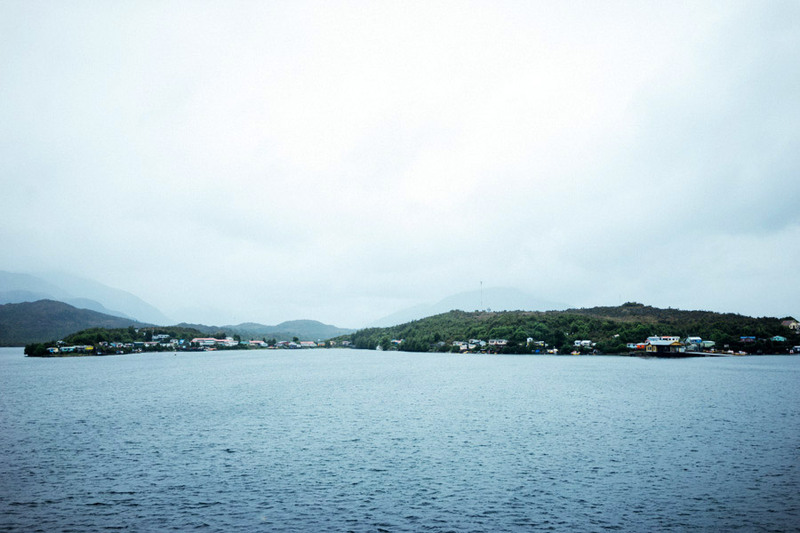 Small wooden boats, houses on pilotes, and a few roaming dogs. The icy winds remind us we’re now in Patagonia. It’s a colorful road trip of friendship, long talks, shared music, and hope for the next bottle of wine. But our time is short. After a spontaneous drive north to Puerto Varas for a night, we are back in Puerto Montt to say goodbye to Tonya and prepare to board a four-day boat ride through the Patagonian channels and fjords. We chose to visit Chiloé Island since it is off the beaten path and looked like a perfect places for slow travel. Follow the wooden church road: Churches of Chiloé. We enjoyed Club Social Baquedano in Ancud for their ceviche, fish soup, and beer selection. This is the second most populous town, but it still has a very small feel. Be sure to stop by the local market and the museum and artist workshop off the main square. The sculptor of the mythical stone works around town might just be working. In Castro, visit the most popular church on the iglesia circuit (the big yellow Church of San Francisco), and restaurant Pomodoro for a bit of comfort food: pasta and wine. 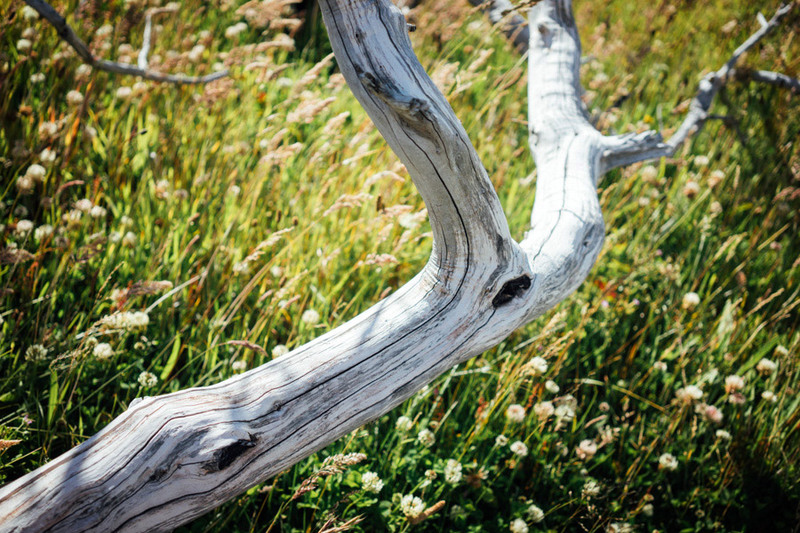 Passing through Llau-Llao check out Puntilla Ten Ten for wooden artwork and the perfect boardwalk to do yoga. There is also a penguin colony in Puñihuil that we did not have time to see, as well as recommended trips to the smaller islands on the east side (you have to ask a local fisherman to take you!). One of the best things about Chiloé is the free roaming sheep. There are beautiful wool works in every small village shop, so support the local community and take a beautiful handmade sweater or woven tapestry home. We are Alex & Madie, a French-American couple from San Francisco, on a year-long travel around the world. Currently back in California. © 2018 Alexandre Guion & Madelene Farin. All Rights Reserved.